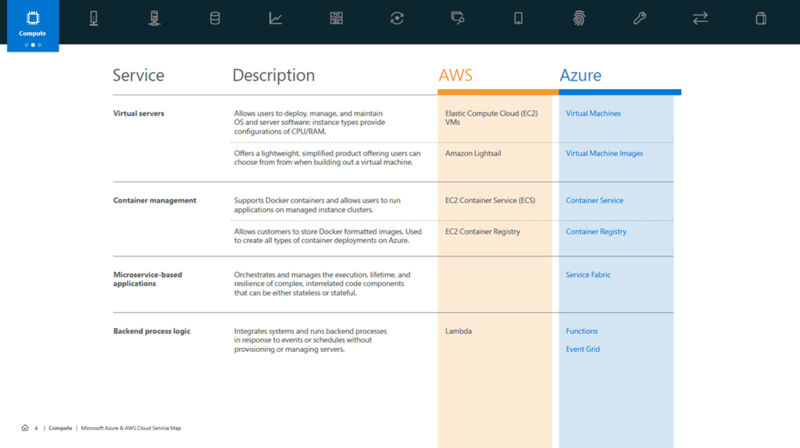 Today, we are pleased to introduce a new cloud service map to help you quickly compare the cloud capabilities of Azure and AWS services in all categories. 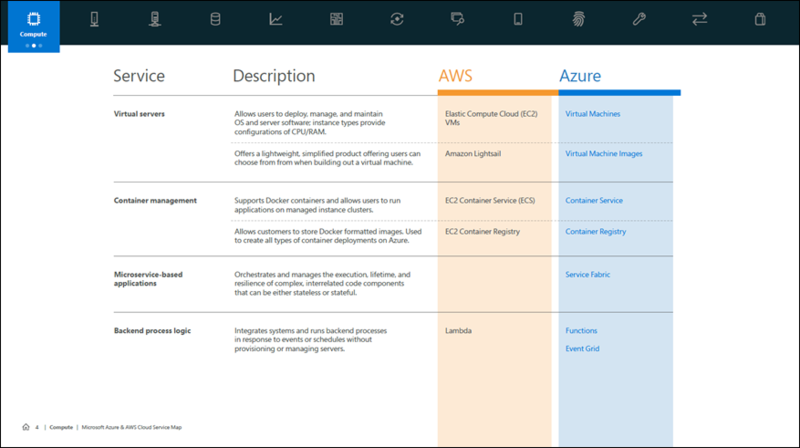 Whether you are planning a multi-cloud solution with Azure and AWS, or simply migrating to Azure, you will be able to use this service map to quickly orient yourself with the services required for a successful migration. You can use the service map side-by-side with other useful resources found in our documentation. Marketplace – Cloud marketplace services bring together native and partner service offerings to a single place, making it easier for customers and partners to understand what they can do. Compute – Compute commonly refers to the collection of cloud computing resources that your application can run on. Storage – Storage services offer durable, highly-available, and massively-scalable cloud storage for your application, whether it runs in the cloud or not. Networking & Content Delivery – Allows you to easily provision private networks, connect your cloud application to your on-premises datacenters, and more. Database – Database services refers to options for storing data, whether it’s a managed relational SQL database that’s globally distributed or multi-model NoSQL databases designed for any scale. Analytics and big data – Make the most informed decision possible by analyzing all of the data you need in real time. Intelligence – Intelligence services enable natural and contextual interaction within your applications, using machine learning and artificial intelligence capabilities that include text, speech, vision, and search. Internet of Things (IoT) – Internet of Things (IoT) services connect your devices, assets, and sensors to collect and analyze untapped data. Management & monitoring – Management and monitoring services provide visibility into the health, performance, and utilization of your applications, workloads, and infrastructure. Mobile services – Mobile services enable you to reach and engage your customers everywhere, on every device. DevOps services make it easier to bring a higher quality app to market faster, and a number of engagement services make it easier to deliver performant experiences that feel tailored to each user. Security, identity, and access – A range of capabilities that protect your services and data in the cloud, while also enabling you to extend your existing user accounts and identities, or provisioning entirely new ones. Developer tools – Developer tools empower you to quickly build, debug, deploy, diagnose, and manage multi-platform, scalable apps and services. Enterprise integration – Enterprise integration makes it easier to build and manage B2B workflows that integrate with third-party software-as-a-service apps, on-premises apps, and custom apps. The guidance is laid out in a convenient table that lets you easily locate and learn more about each service you are most interested in. In this instance, you can quickly see the service name, description and the name of the services in AWS and Azure. We’ve also provided hyperlinks for each Azure service. Thanks for reading and keep in mind that you can learn more about Azure by following our blogs or Twitter account. You can also reach the author of this post on Twitter.